According to the American Optometric Association, 70 to 75 percent of computer workers experience eyestrain. There are over 60 million Americans overall with symptoms. The symptoms typically include headaches, dry eyes, blurred distance vision, haloes, double vision and generally irritated and fatigued eyes. Working at a computer requires a great deal of eye movement and eye focusing. The constant re-focusing effort stresses the eye muscles, leading to computer related vision problems. It can impact greatly on a person’s comfort and productivity, whether they are at work, school or home. Computer Vision Syndrome is the term used for any eye or vision problems related to computer use. Furthermore, there are indications that the neck and back pain often associated with computer use may also be the result of eyestrain, as the body continually adjusts to allow the eyes to focus better. According to the American Optometric Association, computer-related vision problems are a form of musculoskeletal disorder, or repetitive stress injury (RSI) caused by the refocusing effort required to bring the computer image back into focus over and over again. A Cornell University study released in January 1999 reported that children may also be at risk for repetitive stress injuries because school computers are often set up incorrectly for children. A computer screen places unique demands on the eye that are substantially different from printed images. Although the computer operator intends to look at the screen, the actual place where the eye is focusing may be behind, or in front of, the monitor. By simulating an actual computer display in the our office, the PRIO system allows us to correct for this and write a prescription that will bring the eye’s focus back to the plane of the computer screen. Prior to the exam, patients should measure the exact distance they sit from their computer screen - measuring the distance from the bridge of their nose to the computer screen - to fully duplicate the focusing demands placed on the VDT user in his or her workplace. They should also note the color of the characters on their computer and the relative angle at which they view the screen (with the computer recommended at 10 to 20 degrees below eye level). Once the prescription has been determined, an antireflactive lens is used for the eyewear to eliminate some of the light emitted by fluorescent lighting, and a light tint can also be added to reduce ambient light and lessen the tendency for after-images or haloes. Adjusting the computer workstation can help prevent some computer-related repetitive stress injuries. Start by adjusting the room lighting or position of the computer to eliminate reflected glare off the monitor. Glare screens may also help. The distance between the monitor and the eyes should be between 18 and 26 inches. The monitor height should be just slightly below eye level, and the keyboard should be placed comfortably within reach. All of these factors can help improve posture, reducing the risk of repetitive stress injuries. Taking frequent breaks is also a very good idea so that the eyes are not staring at the screen distance for a long period of time. If you believe that you are experiencing the signs of computer vision syndrome click here. to schedule an appointment. Computer vision syndrome causes eye fatigue, which can make you feel tired in general. 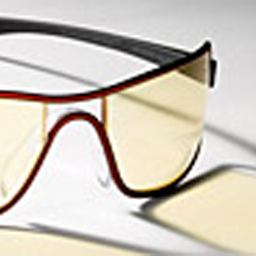 Our Computer glasses include special lens coatings to reduce glare and a tint designed to eliminate eye strain.